In assessing the North Korean nuclear threat, it’s worth pausing to consider just how foolish the Trump administration’s response to the Iranian nuclear deal has been. Here’s a country, Iran, that’s been stopped in its tracks on the path to a nuke, forced to dispose of all its highly enriched uranium, made to slash its low-enriched uranium stockpile, persuaded to shut down most of its centrifuges, and obliged to accept regular international supervision and monitoring of its nuclear facilities. This is gibberish. Such utterances, combined with Trump’s “locked and loaded” Armageddon outbursts this summer directed at Kim Jong-un, the North Korean leader, suggest the Trump administration is fundamentally unserious. 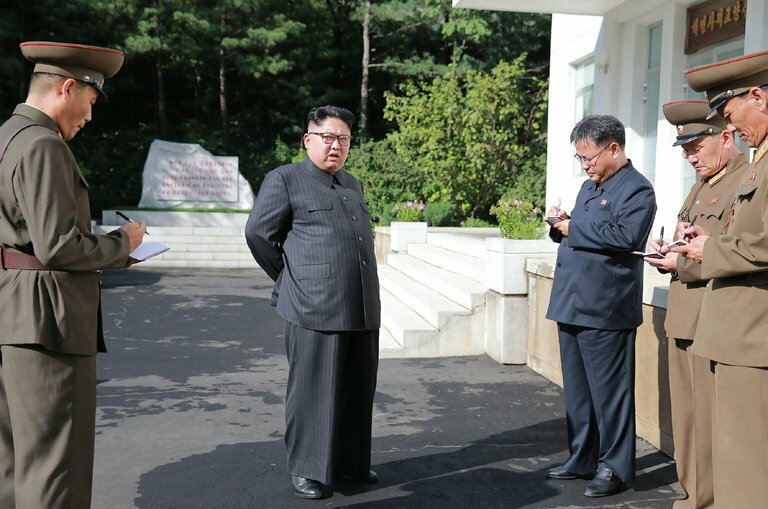 No great news there, of course; and more recent statements like Tillerson’s plaintive praise this week of North Korean “restraint” (before Kim’s appearance on state media visiting a missile-development factory and before North Korea fired short-range missiles from its east coast on Friday) suggest a J.V. team up against the ruthless Kim dynasty. A freelancing president who’s never read a dossier and a weak secretary of state do not coherent policy make. No wonder Kim keeps cackling. North Korea is the least funny threat faced by the United States. It committed in 2005 “to abandoning all nuclear weapons and existing nuclear programs and returning, at an early date, to the Treaty on the Nonproliferation of Nuclear Weapons.” That was a year before it detonated its first nuke. Four more detonations followed during the Obama Administration, to be met with “strategic patience,” a.k.a. weakness disguised as strategy. Kim’s totalitarian regime is working furiously on the miniaturization and other technological advances that would enable it to fire a nuclear-tipped intercontinental ballistic missile at Los Angeles. To put that in perspective, a 33-year-old tyrant who specializes in macabre family executions would hold a gun to America’s head. Santa Monica would never feel quite the same. The way to stop it is not to go all wobbly-kneed a la Tillerson this week. Nor is it to brandish wild military threats a la Trump that could leave the millions of South Koreans within North Korean artillery range seriously dead. It is to be tough and coherent with all the elements of American power: military, diplomatic, economic and covert. Deploy more anti-ballistic missiles in South Korea, just as the Soviet decision to deploy SS-20 missiles aimed at Western Europe in the late 1970’s was met by NATO’s decision to deploy American Pershing II missiles. Step up joint military exercises with South Korea (and do not offer to freeze them in exchange for North Korea freezing tests). Maintain the economic pressure increased this month through a unanimous United Nations Security Council resolution that imposed sanctions on North Korea. Enter deep-dive diplomacy with China to explore what political arrangements on the Korean peninsula could work for Washington and Beijing: an all-smiles dinner at Mar-a-Lago with President Xi Jinping followed by tweeted presidential jibes at Beijing for not delivering on Pyongyang does not cut it. The United States cannot accept Kim pointing a nuclear missile at California; China fears a united Korea that would place American forces on its border. America detests Kim; China dislikes him but sees his uses. So where in the real world is the middle ground? The answer does not lie in Trump’s art-of-the-deal games. It lies in diplomatic seriousness. The covert element — cyber attacks, sabotage — is the most delicate. It must be calibrated to unsettle Kim but not push him into attacking South Korea (for example), an outcome he fears because its end result would be the collapse of his regime. The United States has leverage, but not when its policy is all over the place. Kim’s ultimate goal is his dynasty’s survival. His calculus has to involve the certain knowledge that there’s a limit to what America will tolerate.